Freezing and packaging veggies makes them available for later consumption. But are frozen vegetables healthy? The answer may surprise you. 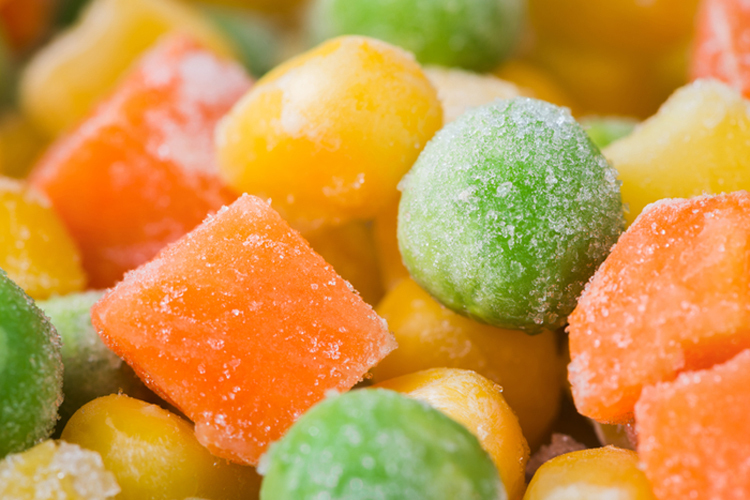 Are frozen vegetables healthy? We intuitively think they "lose" something over fresh veggies, but the freezing process can result in longer-lasting nutrients. With fresh-picked local produce, the snap peas still have their snap, the cauliflower keeps its crunch, and mushrooms aren’t mushy. But when the freshest vegetables are unavailable or unaffordable, frozen produce is a viable option. For consumers, it often brings up a natural question: Are frozen vegetables healthy? The short answer: Frozen vegetables often have as much or even more nutrients than the produce found in supermarkets. For certain dishes, they are as good or better than fresh vegetables. In fact, vegetables flash-frozen soon after harvesting—thank you, Clarence Birdseye—may be more nutritious than fresh. Eating a mix of fresh and frozen can help you get the recommended daily servings of fruits and vegetables no matter what time of year. Most of us know that whole, unprocessed vegetables are a cornerstone of healthy diets. Nutrition science says that eating a variety of produce, especially “superfoods” like leafy greens, provides the spectrum of nutrients you need to maintain good health. So what is it that makes a food “super”? 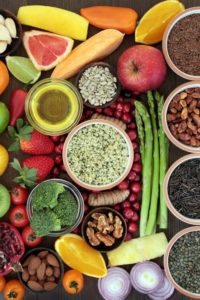 Our Dawn Bialy, executive editor of Women’s Health Advisor—a monthly publication produced in cooperation with Weill Cornell Medical College—explains in our post What Are Superfoods? See also Bialy’s companion post Superfood Claims: 4 Clues to Help You Steer Clear of Not-So-Super Selections. Frozen vegetables may seem like a poor substitute for fresh, but there’s much more to this story. The nutritional punch of vegetables depends on just how fresh your “fresh” produce is. Obviously, wilted lettuce and saggy bell peppers are not ideal. But even unblemished, succulent-looking produce on display under misting spray on refrigerated grocery-store shelves have already lost some of their nutritional value. One reason is that some nutrients in fresh-picked produce break down when exposed to heat, light, and oxygen in the air. Refrigeration helps, but you can’t stop chemistry. Another way that fresh produce may take on less nutritional punch than you think relates to the realities of mass-production farming. Vegetables are picked before they ripen so they can be stored and shipped with minimal damage and to maximize their shelf life. As a result, these foods may come up short on nutrients formed during the natural ripening process. 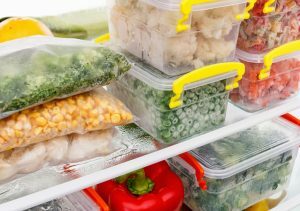 Not a bad thing to stash in your freezer: bags and containers of broccoli, corn, cauliflower, peas, peppers, and other nutritious vegetables. So how do frozen options stack up to fresh? A team of researchers at the University of California–Davis reviewed past studies of the nutritional content of fresh and frozen produce. The researchers came to some interesting and useful conclusions. A head of lettuce, a bunch of radishes, a peck of peppers, or any other whole foods contains two types of stuff you need for good health: macronutrients and micronutrients. You need relatively large amounts of macronutrients, food components that include carbohydrates, protein, fat, fiber, and water. The UC-Davis scientists found that fresh, frozen, or canned produce all have roughly the same amounts of macronutrients. Micronutrients include the vitamins, minerals, and amino acids that you need in relatively small amounts. That’s because micronutrients are essential for making enzymes, hormones, and other life-giving substances in your body. The UC-Davis scientists found that fresh produce can lose about half of certain micronutrients during storage or cooking. Among the most vulnerable nutrients are vitamin C and the the B vitamins thiamin, B6, and riboflavin. Within a week of refrigerated storage, fresh carrots can lose close to 80 percent of their vitamin C.
Frozen produce tends to preserve fat-soluble vitamins such as A and E and carotenoids (such as lycopene). However, thawing or cooking frozen vegetables starts the clock on nutrient loss, so eat them right away. It’s good to keep in mind that nutritional content is just one factor that influences food choices. Taste, price, convenience, and expected shelf life are all important. Plus there’s the factor that health reporters sometimes ignore: the eating experience itself. This is where frozen vegetables options can fall short. Freezing alters a vegetable’s natural firmness and “mouth feel.” Limp mushrooms or broccoli florets just don’t compare to the firm, crunchy ones you enjoy raw on salads. On the other hand, in dishes like soups, stews, and casseroles, frozen vegetables work great. And despite the loss of crunch in defrosted veggies, you can’t beat the convenience of being able to toss a handful of mixed vegetables into a bowl, add a splash of broth, and lightly microwave for a quick and healthy side dish. And by the way, watch out for frozen vegetable products with added flavorings and sauces. They can be high in sodium, preservatives, and other ingredients you may be trying to avoid. add, amino acids, are frozen vegetables healthy, b vitamins, carotenoids, carrots, cauliflower, cooking, corn, fiber, food, good health, health, healthy diets, lycopene, nutrients, nutrition, nutritional value, preservatives, protein, vegetables, vitamin, vitamin c, vitamins, vitamins minerals, what are superfoods, women s health advisor, womens health. I thought you might be interested in this article on https://universityhealthnews.com: Are Frozen Vegetables Healthy?